Berlin is scattered with little takeaway pizza places, most are relatively cheap, fill the hole but are nothing to write home about. Garda is a welcome exception. Slightly off the beaten track in Schöneberg this small but authentic family owned pizzeria is, in my opinion, the best pizza you’ll find this side of the alps, definitely the best pizza I’ve had in Berlin. The dough is freshly and expertly made each day, soft and crispy in all of the right places. The chef can be seen in the back room rolling, stretching and kneading the dough into giant rectangular pizza bases. Due to demand, new pizzas appear constantly from the oven, offering a traditional and fresh variety of toppings – my favourite is artichoke, cherry tomato and fresh basil although anchovis is also extremely good. 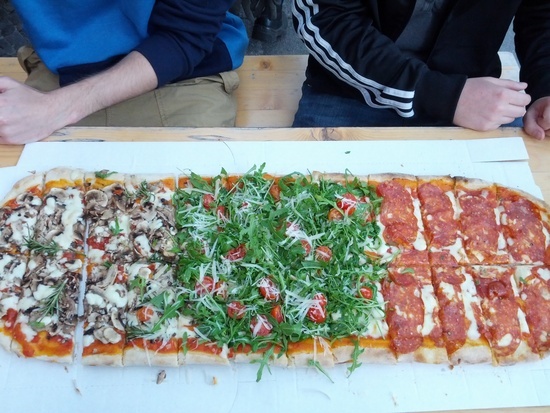 The rectangles are cut into smaller squares – about 20cm which cost €1,80 (margherita) or €2.00 (everything else). The couple who run it are very friendly and happy to make whatever you fancy if it’s not already out. Despite the fact that it is usually pretty busy you never have to wait more than 5 minutes for your delicious slice. If you don’t want to take away there is limited seating inside where you can wait or eat with a peroni or a glass of wine with chilled jazz music in the background. 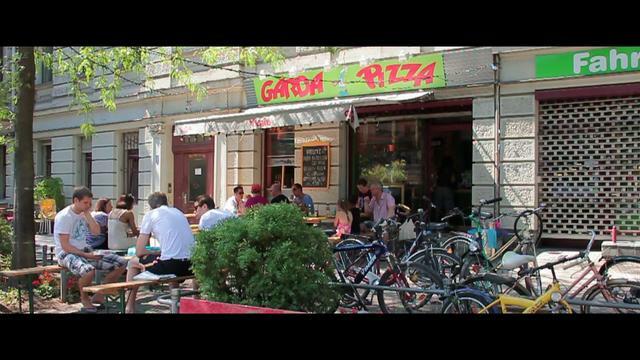 In summer wooden benches and tables fill the street with pizza eating Berliners.